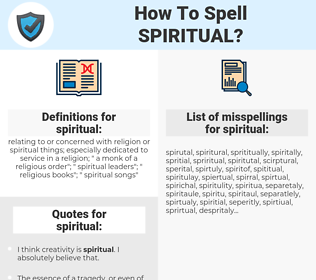 What are the misspellings for spiritual? What are the common mistypes for spiritual? What is the definition of spiritual? What are the quotes for spiritual? What are the translations for spiritual? 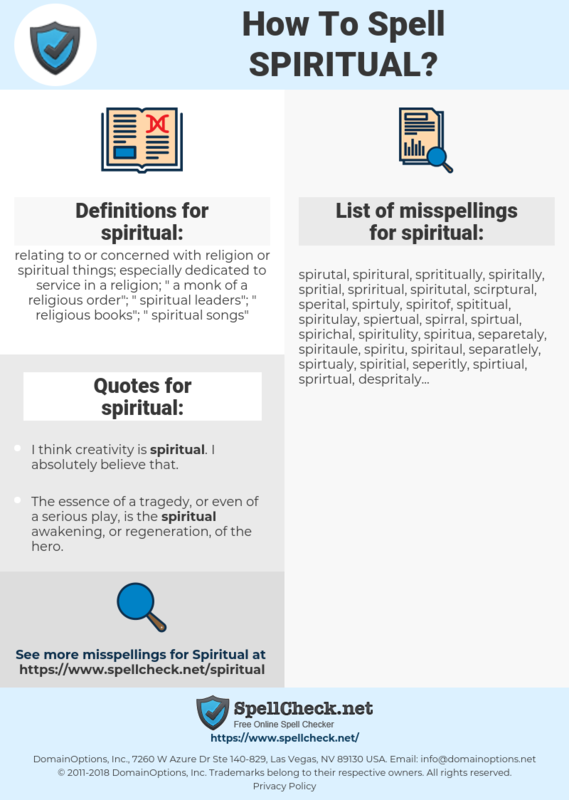 What are the common typos for spiritual? relating to or concerned with religion or spiritual things; especially dedicated to service in a religion; "a monk of a religious order"; "spiritual leaders"; "religious books"; "spiritual songs"
This graph shows how "spiritual" have occurred between 1800 and 2008 in a corpus of English books. As far as spiritual influences in Christian music, I would say Crystal Lewis- a lot of her songs especially. The ministry she has through her songs has really hit me. It isn't until you come to a spiritual understanding of who you are- not necessarily a religious feeling, but deep down, the spirit within- that you can begin to take control. geistig, seelisch, ideell, geistlich, vergeistigt, spirituell.